Creating the videos below was a long and painful process, but they're finally done! The videos take you step-by step through the process of installing a DCC decoder in a brass steam locomotive - a Sunset/3rd rail B&O Q4b in O Scale to be precise. 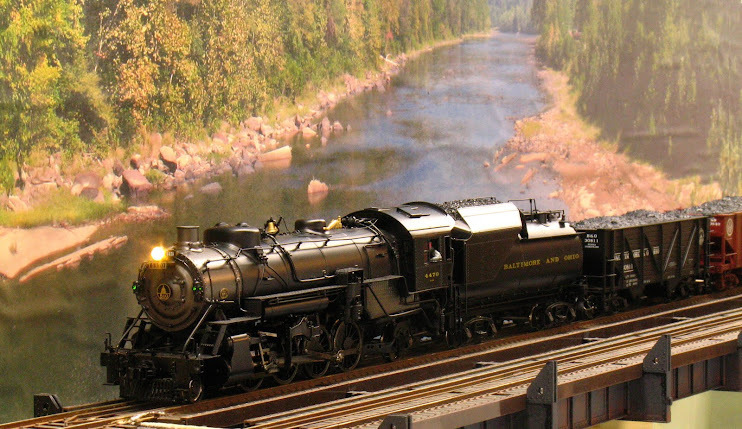 There's no reason to be hesitant to disassemble and modify a brass locomotive; and the Sunset locos seem to be well soldered and sturdy. Hopefully these videos will give you the information and confidence that you need to tackle the job yourself. In fact, getting the installation right took me a couple of attempts to find the right combination of miniature connectors and flexible wire to make the installation work - but that is all explained in the film. Be sure to view the videos in order. There is one omission that I must mention. In hooking up the backup light I forgot to film (or mention) the necessity to include a resistor in the line going to the backup light. This resistor is necessary once the backup light is hooked up directly to the decoder. Use a value of 500 to 1000 ohms and put the resistor in either line of the LED backup light. In viewing the videos, do not click on the "HD" unless you have high speed internet and a fast computer (dual core processor and good video card); and you still may want to allow the video to buffer before playing. A few months ago I purchased a full set of the Fast Tracks turnout construction fixtures. The point/frog forming tool, the stock rail forming tool and the turnout fixture itself for a #6 switch. The videos on the Fast Tracks website provide a good overview on how to use each of these tools and I watched them before buying. However, the O Scale fixtures are a little different then the ones for the other scales, and are not covered by Fast Track's videos. In addition I developed some techniques for using Fast Tracks that may be helpful. So I made this video to demonstrate all that I learned. One more tip that came up after I finished the video. I installed a bunch of these turnouts in a yard ladder and as part of the installation I checked for shorts. While I did not find any dead shorts, I found some leakage between the left and right rails. This drove me nuts for a while until I isolated it to melted flux bridging the gaps in the PC board ties. Since the Oatley flux is a tinning flux, it's mildly conductive. So if you use the Oatley tinning flux, be sure to clean it out of all of the gaps (or use less flux than I did). I found that "Goo Gone" is a good cleaner to use for this purpose. This is the first video that I've posted that is compatible with the iPhone & i Pad. If you have trouble loading or playing this video, please leave a comment outlining your problems so that I can correct them. Like this video? Leave a comment. Don't care for videos? Leave a comment. Like videos compatible with mobile devices? Let me know; if there is enough interest I can go back and change other videos. When I first started building this layout, I had to put in 3 single crossovers, requiring 6 switch machines. I spent a considerable amount of time under the layout affixing switch machines - and bumping my head. Now that I'm working on the yard ladder into hidden staging and I've come up with a simple and obvious way to attach switch machines without all of the hassles. The problem with attaching the Tortoise machines is that the built-in mounting ears are too close to the machine to reach easily with a screwdriver. Plus the machine is small and it's hard to position it critically and drive the screws without pushing the machine out of place. 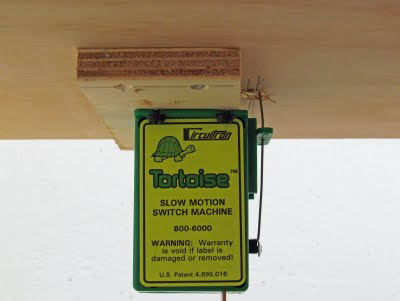 To alleviate these problems I've attached each Tortoise machine to a scrap of plywood. The size of the plywood is not important so long as it extends well past the machine proper. The plywood is, in turn, mounted to the underside of the layout. 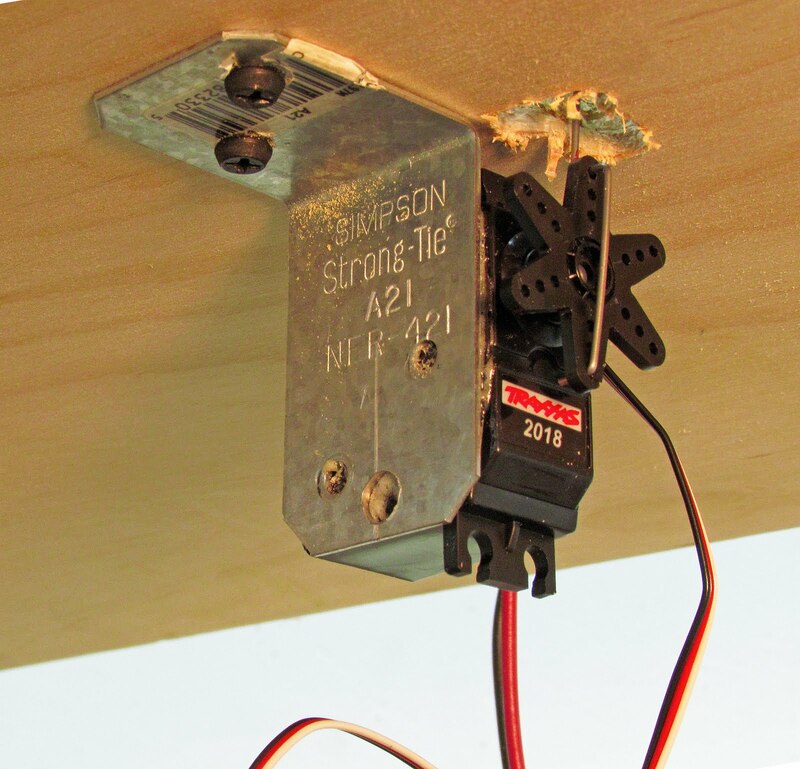 The plywood forms a 'handle' that makes it easy to position and screw the machine in place without movement. These photos should be self-explanatory. You'll notice in the pictures above that the actuation mechanism of the Tortoise machine simply extends past one edge of the plywood mounting plate. In this way it is not necessary to drill a hole for the actuation wire through the mounting plate. Also note that I have pre-drilled and countersunk holes for the mounting screws. Four holes are not really necessary, but it provides some flexibility in where the mounting screws will be driven. The combined thickness of the mounting plate, subroadbed (plywood) and roadbed (cork and foam) is well over 1". 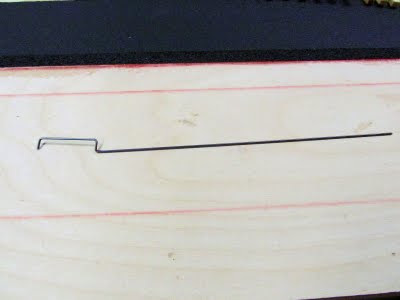 This would be too thick if I were using the music wire actuator that comes with the Tortoise; but I am already replacing the actuator with heavier wire, so I simply cut this wire longer. 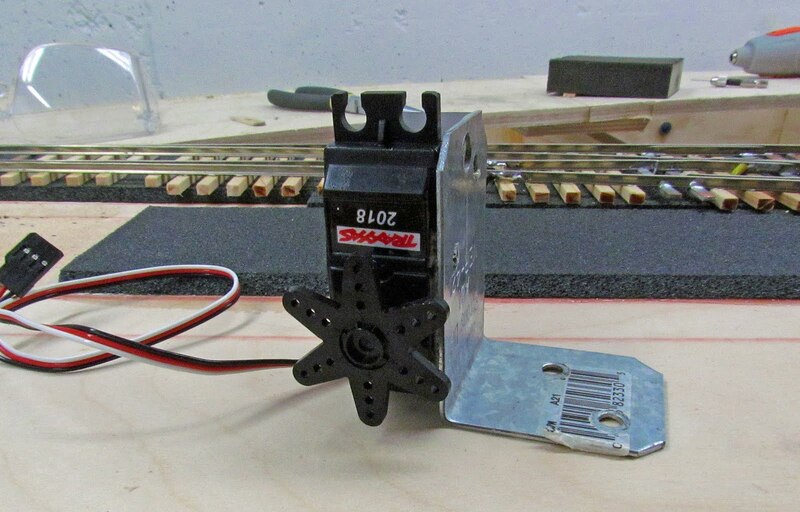 In O Scale a #6 switch is approx 18 inches long and track center-to-center spacing is typically about 4"; so switches cannot be densely packed and there is plenty of room under the table for these oversize plywood mounting plates. In the smaller scales, this approach may not be possible. I'm taking the opportunity of motorizing all of the switches in hidden staging to experiment with servos as switch machines. While I will eventually experiment with the servo actuators from Tam Valley Depot and Duncan Mcree, I currently have an ESU stationary DCC decoder that drives servos. To use the decoder that I have I had to buy a servo at the local hobby shop (ouch!) rather than pay less and wait for it to arrive via mail-order. 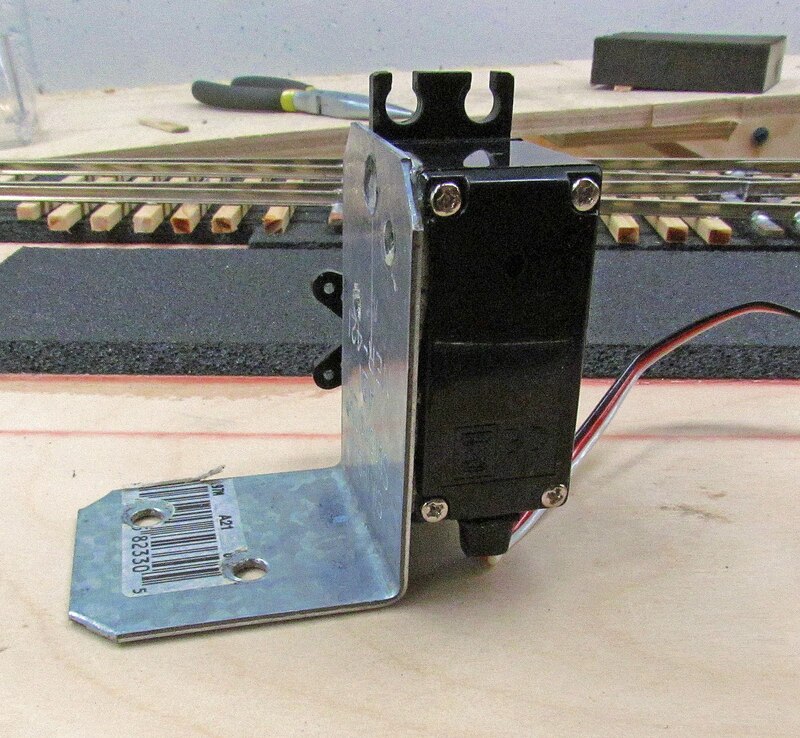 How to mount the servo was a problem. After thinking about it for a while, I decided on the following technique. I simply glued the servo to a right angle bracket sold in home centers for building decks. The bracket is Simpson 'Strong Tie' A21Z, note: this is the right angle bracket with one arm longer than the other, that's the arm that the servo is glued to. I used Gorilla Glue to attach the servo. I roughed-up the bracket and servo with sandpaper before I dampened the bracket with water and applied a THIN coat of the glue to the servo, then clamped the two together. Since I used a thin coat, this time the glue did not foam up all over the place; I've finally found a use for Gorilla Glue. The self-retention feature that you see in the video works because I am using relatively stiff 0.039 wire as a actuation arm. That allows the right angle bend at the end to exert enough outward pressure to hold the arm in place. If you use significantly thinner wire this might not be the case. It been a while since my last post; 3 of the 4 weekends in May were taken up with activities away from home that kept model railroad progress to a minimum. That is not to say that I got nothing accomplished. Here are photos of a scratch built 62"/48" curved turnout that I started in May and, technically, finished in June. The paper template for the turnout is laid upon the back of a 2' x 4' ceiling tile. Why a ceiling tile? My last scratch turnout was laid down on a piece of plywood and each spike hole had to be pre-drilled - a real pain. 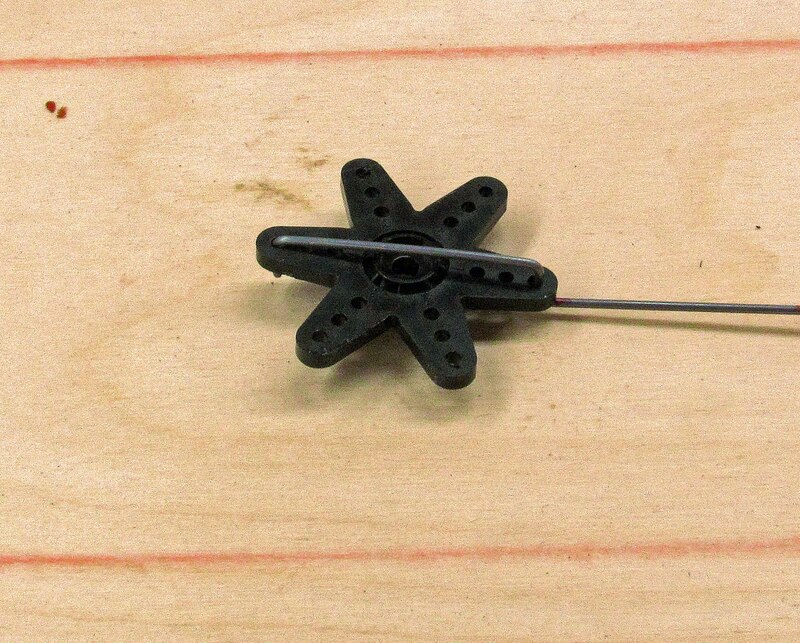 The spikes (actually "Perfect" brand track nails) push into the ceiling tile easily and hold well enough to solder the turnout; when the turnout is finished the spikes can be removed and reused. The ceiling tile is, in turn, supported by plywood as it would bend and break otherwise. 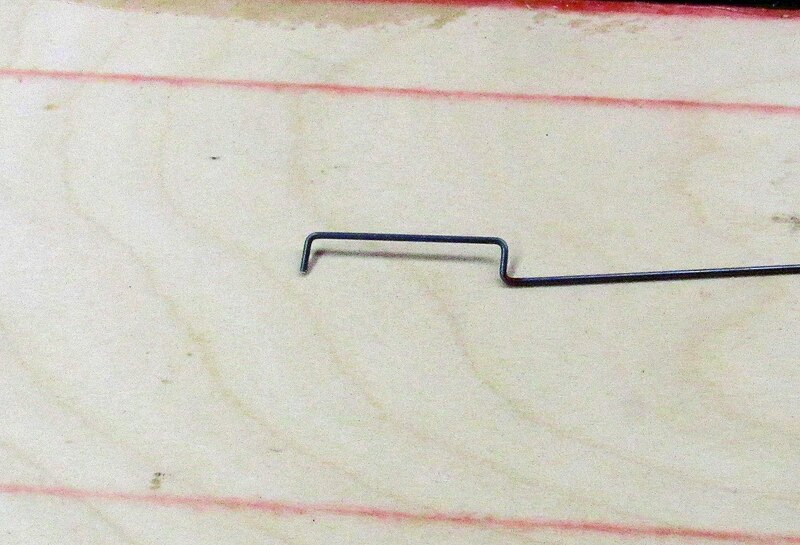 This latter picture shows the frog before the excess solder was cleaned up by filing and sanding. The Fast Tracks frog/point form and stock-aid tools were used to aid construction. I have to say that I enjoy hand laying turnouts; I just wish that I was more adept at it as it still takes me far too long. However getting a smooth running turnout that is an exact fit for the location is nice. For instance, the 62" outer radius exactly fits the curve where this turnout will be located and the turnout was made with the code 156 rail found in the old (1970's) Atlas flex track as the hidden trackage is the old Atlas flex. Another May project: I did some mold making. A couple of months back, I saw some "Ultimate, Make-A-Mold Master Castings" rock castings by Ultimate Scenery Center (www.ultimatescenery.com) on a vendor's table at a train show. It was love at first sight with these castings; unfortunately, I had expended all of the money that I wanted to spend that day. I recently found some of these castings at Mainline Hobbies in Blue Ridge Summit, PA (BTW an excellent train store) and snapped up a couple. These are highly detailed, urethane foam castings that the manufacturer actually intends to be used as masters for the purchaser to use to make his own molds. I like this concept, no longer do you have to be in a gray area of legality or morality by making a mold from someone else's casting. Click on either photo to get a full-size view. 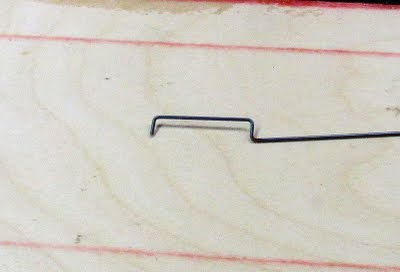 I was going to use the technique that I used in my O Scale Trains article to make an open-face mold, but the manufacturer included detailed instructions for making a reinforced latex 'glove' type mold, so I decided to follow their instructions. Here's a photo just before starting the process. 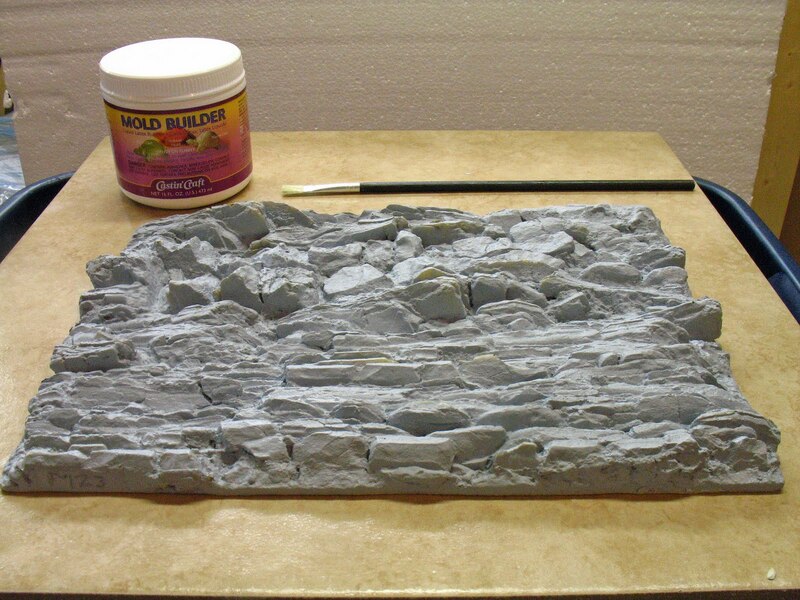 I used the same 'Mold Builder' latex mold compound that I bought at Michael's and used for the OST article. Mold Builder is not the manufacturer's recommended mold making compound, but I had it on hand. I don't know if the substitution effected the outcome. 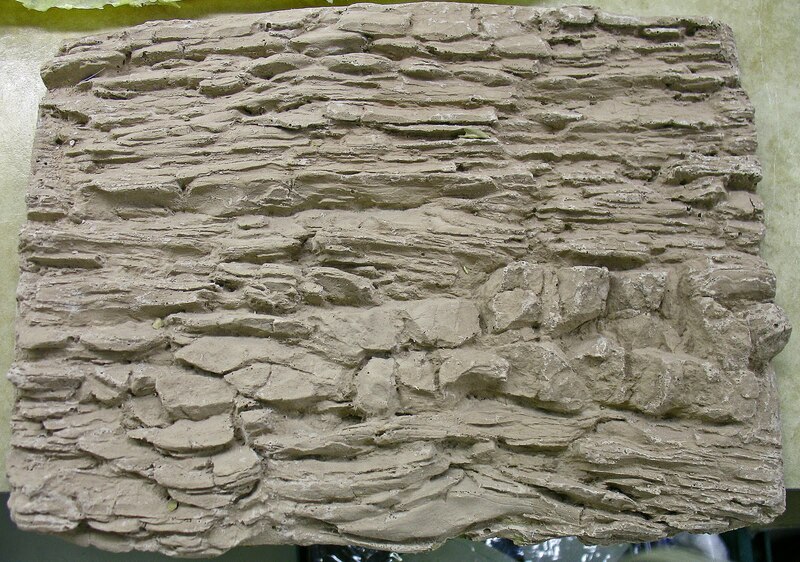 The surface that I am building this mold upon is a 18" x 18" ceramic floor tile obtained from Home Depot. I chose the smoothest 18" x 18" tile that I could find, although this was a floor tile and not a glazed wall tile like I build smaller molds on. To make the tile's matte surface smoother, I coated it with clear gloss spray from a spray can. 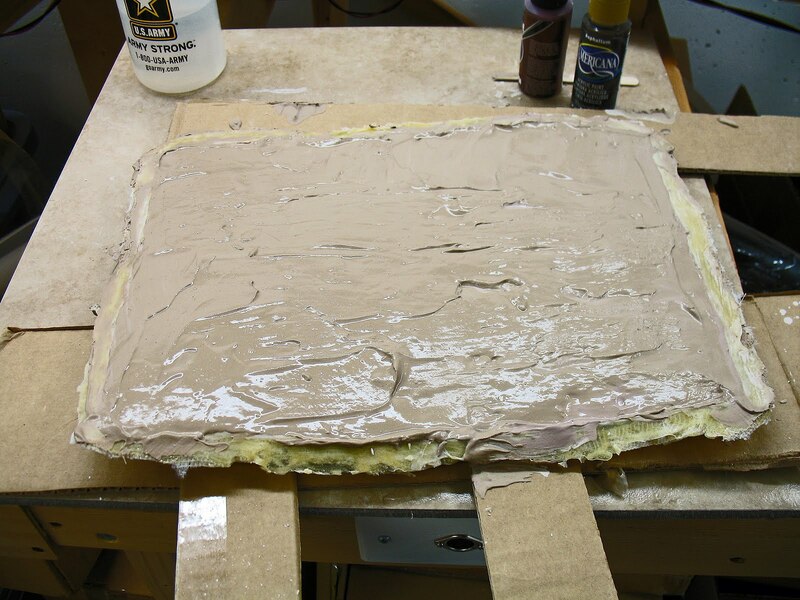 A smooth surface will prevent the latex from adhering and facilitate removal of the finished mold. And here's the first coat of latex applied. The latex is brushed on. The first coat of latex must be applied thin and without bubbles - unless you want bubbles to be a permanent part of the mold and of each subsequent casting; so watch your brush strokes. I extended the latex beyond the sides of the master casting to form a lip on the finished mold about 3/8" wide. 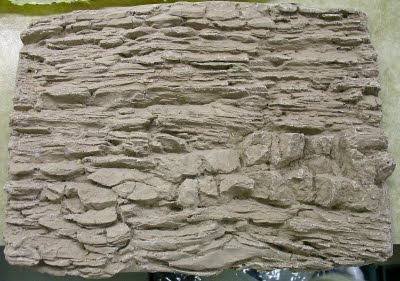 Here's a pic of the mold after a couple of coats of latex have been applied and dried. Ultimate Scenery instructs to apply four coats of latex before the next step. Being a 'belt and suspenders' type, I applied five. Next you are instructed to apply a coat of latex and wait for it to get 'tacky' then layer the entire thing with gauze. The gauge is supposed to be forced into all of the cracks. 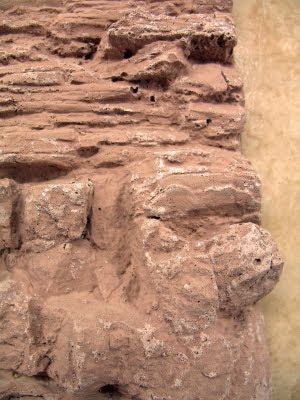 Even though I cut my gauze into 3" long strips for ease of manipulation, this master casting has so many small cracks that I could not get the gauze down into all of them; it would lift out and/or bridge over the detail. Maybe the latex that I used was not tacky enough. After the latex/gauze/latex coat as dried; four additional coats are to be added before the mold is done. Just to be sure, I added six. Making the mold took a lot of latex, the lion's share of the jar was consumed in the 14 layers of latex that I applied. The chocolate pudding color of the plaster came from a failed attempt to color the plaster with the craft store acrylics that you see peeking out in the upper right of the picture. Actual rock samples and photos taken from the area I'm interested in are a chocolate type brown, but darker than the color I got with the acrylics. The casting is not bad, if you can look past the weird color (which will be fixed by spray paint). The details seems to reproduced well, however there are a few bubbles that will need to be fixed, probably the result of my pouring technique. A final observation: If you look at the pictures of the mold, you will see that some gauze extended beyond the latex rubber. I cut most of this away, but did not seal the ends of the gauze with additional rubber. During casting the gauze absorbed water and wicked it into the mold between the layers of rubber. This made the mold slimy and it took on a milky color. Now two days after demolding the mold is beginning to dry out and return to it's normal state. It's possible that this is responsible for the chalky white deposits that you see in the close-up. I find it hard to believe that water between the layers of latex made the mold slimy, but it did. Next time I'll try sealing the gauze completely.